Students in first and second grades at Sandy Creek Elementary School performed several Thanksgiving-themed songs under the direction of music teacher Jackie Hobbs during the Annual Thanksgiving Feast. First and Second grade students at Sandy Creek Elementary School held their annual Thanksgiving Feast where they entertained the audience with a variety of Thanksgiving-themed songs before feasting on the traditional Thanksgiving fare. 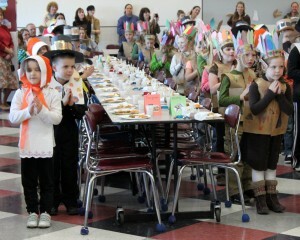 The Thanksgiving event, which featured a gathering of Native Americans played by the first graders and Pilgrims, played by the students in second grade, also included a feast of similar food items consumed at the original Thanksgiving feast. A packed audience was on hand and they were delighted by the creative costumes, entertaining songs and the holiday performance by the students. The event was a collaborative effort between the music and art departments and the classroom teachers. 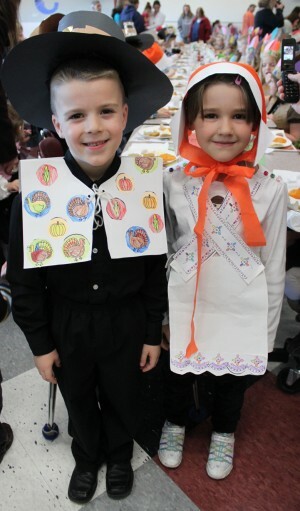 Cade Stoker, left, and Delaney Lococo look like the perfect Pilgrims. Students created their costumes in art class, practiced songs in music and in their classrooms and crafted special Thanksgiving placemats in class that were personalized with their own list of things for which they are thankful. The concert certainly started the Thanksgiving break with a true feeling of gratitude and an extra helping of holiday spirit.